The cheetah is probably best known as the world’s fastest land animal. A cheetah can attain the speed of 112 km/h (70 mph) during short bursts of speed, and its average speed while hunting is 64 km/h (40 mph). However, few people know that the cheetah belongs to vulnerable species and can become endangered unless the situation improves. Cheetahs used to inhabit most of Africa and significant parts of Asia. Sadly, the range of the cheetah across Africa has declined to a mere 10% of the historic expanse. In Asia, the cheetah occurs mainly in Iran and possibly a few areas of Turkmenistan, Afghanistan, and the Indian subcontinent. There was a plan to reintroduce cheetahs in India, but it was put on hold in 2012. 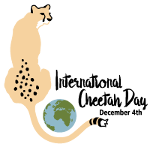 A major reason behind the decline in the cheetah population is habitat loss through industrial and agricultural expansion. The cheetah is used to hunting in the open area, requires a large area to live, and isn’t very good at coexisting with humans. Another reason is the so-called population bottleneck, also known as the genetic bottleneck. It is believed that cheetahs nearly became extinct during the last ice age. The resulting inbreeding reduced the genetic diversity of the cheetah population, which led to decreased fertility and susceptibility to disease.